Not all piston air compressors are created equal. If you are serious about your business, don’t go for cheap products. The price you pay now will soon be forgotten, but the quality, efficiency and reliability of your compressor will be evident throughout the life of the machine. What to look at when choosing your machine? Efficiency – Single stage compressors are cheaper, but less efficient. If you need a compressor for home or won’t require it often, choose a single stage. It has the advantage of a larger capacity at lower pressures. 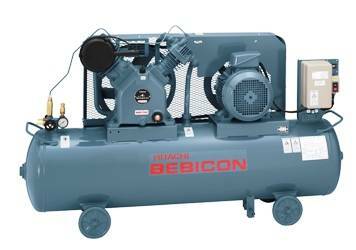 For serious commercial and industrial applications (workshops, auto shops), a two stage compressor is the best option. Two stage units give better efficiencies at higher pressure. Pressure – Will 7 Bar be enough for the tools you are going to operate today and in 2 years’ time? Two stage compressors would go over 9 Bar. Run time – Will your compressor overheat in 15 minutes? What happens if you work through the typical Aussie summer with +40C in your workshop? Hitachi two stage compressors can run nonstop, without the need to cool down. They can operate with a duty cycle of 100% compared to cheaper single stage machines with a duty cycle of 50%. Brand – There are brand names that say it all – quality, value for money, durability. Hitachi piston air compressors are the number 1 reciprocating compressors in Japan, with more than two millions of units sold throughout the world. They are now available in Australia, and this is the compressor you need if you aim to be the best in your business.